A cost-effective, high-impact direct marketing system for businesses targeting savvy consumers that “shop local and want to save”! Do you need to reach more consumers? Drive more consumers to your website? Want to build a loyal customer base? Create Call-To-Action that motivates consumers to engage and respond to your business? Are you in the conversation when consumers are ready to buy? YAPABOOK is an advertising solution focused on “Shop Local and Save”. We have elevated the direct marketing experience. It’s an upscale Direct Mail and Mobile offers platform to specifically appeal to home and lifestyle shoppers. Our cutting-edge marketing system offers an advertising opportunity that is sure to put and keep you in the conversation when consumers are looking to purchase products or services. Local business is the lifeblood of the community. Community’s thrive when local businesses are supported. However, this takes a movement of sharing, referrals and consistent marketing to create awareness for the local businesses in the community. More money stays in the local community when you encourage and attract consumers to shop local. When consumers spend local a majority of each dollar is cycled through the local community vs. spending with national chains and online means a large portion of the money is leaving the community. When you use the YAPABOOK system and provide an offer for consumers, it motivates them to shop local and save which keeps most of the money in the local community to fund and preserve the services that everyone enjoys! So what does YAPABOOK do? We connect local businesses and consumers which forms a community network. This network brings businesses and consumers together where they will be met with upscale Home & Lifestyle Offers which provides savings for them, profits for you and keeps dollars in the local community. In unison, consumers seeking your offer will see other offers from local businesses and consumer’s seeking other offers will see your offer, therefore creating the network that benefits all local business in the community using our system. Marketing and Access to your offers available through 3-channels. 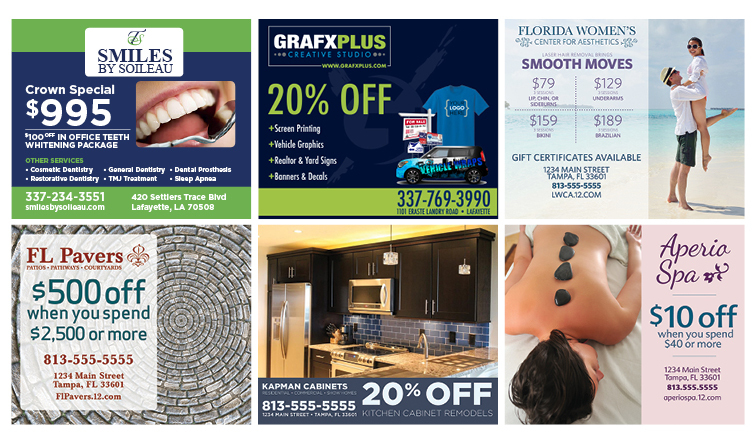 DIRECT MAIL – Special offers for your product or service are transformed into a beautiful custom-designed ad in our high-quality offer booklet. 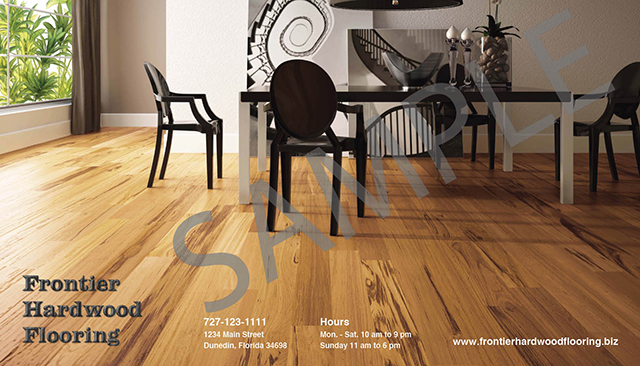 We mail the booklet to thousands of qualified consumers 4-times per year. ONLINE – Your business is provided a custom online profile at YAPABOOK.COM. Consumers can search, view, print and share your offer. 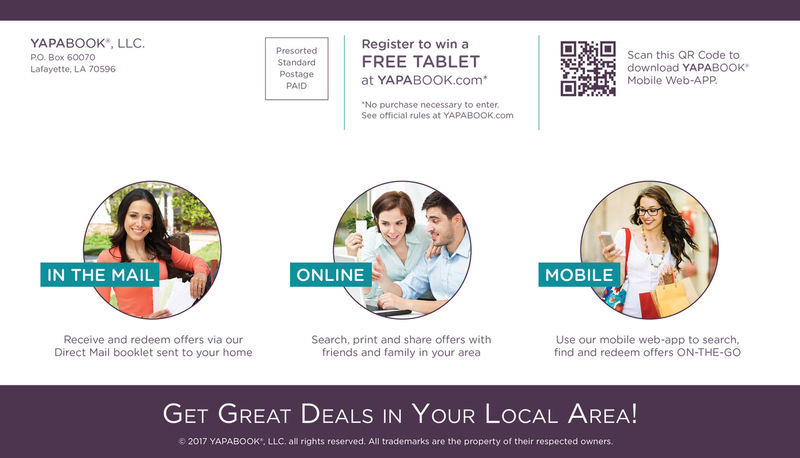 MOBILE – Consumers looking for deals on-the-go can access YAPABOOK.COM from any mobile device to redeem your offer. They can even place it on their home screen as we created our own favicon for easy access. 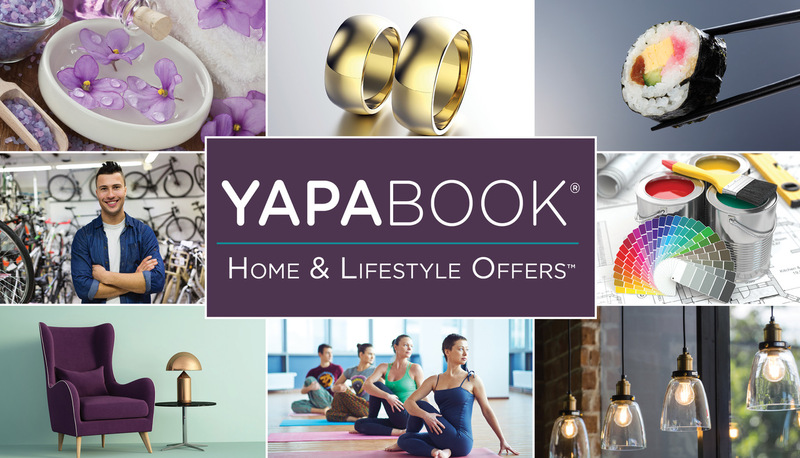 Direct Marketing with Consistency and a call-to-action is a powerful way to build your brand and YAPABOOK is the ideal solution for home and lifestyle companies looking to engage new consumers! Something that is added, especially something that a merchant gives to a customer to create savings and value. What you get when you use YAPABOOK. YAPABOOK is a multi-channel advertising solution that puts your product or service in front of potential consumers. We have elevated the direct marketing experience. It’s a unique Direct Mail and Mobile offers platform that specifically appeals to home and lifestyle shoppers in the local community. The YAPABOOK team has over 30-years of marketing and advertising experience. 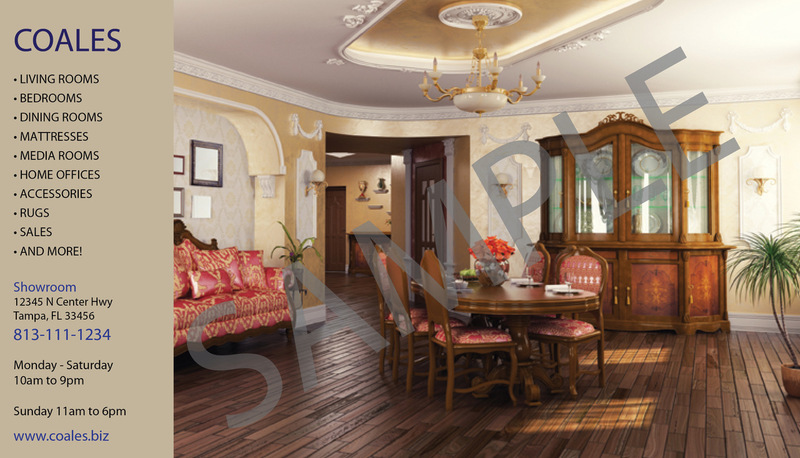 We understand the importance of maximizing every dollar to create the best possible return on investment. Muli-Media and Marketing synergy can be a powerful formula if the mediums involved are bought correctly. The issues and problems start when these mediums are not bought at levels that can break-through and have enough market penetration to deliver desired results. Mediums such as Network TV, Cable TV, Radio and Outdoor do provide mass appeal, cover the market and have diversified audiences. However, in many cases these mediums are not bought as the necessary benchmarks to deliver due to their cost and limits on advertising budgets. This is why taking a synergistic targeted approach can dramatically improve an advertiser’s results and return on investment. Our Theory; if a business is using mass market media, then implementing a cost effective shared direct mail + mobile platform should be considered to reach a targeted audience. This way you get the best of both worlds, mass and target! Research has shown that when other mediums such as TV, Cable, Radio and Outdoor are tied-in with direct mail, the results and “Return on Investment” are tremendously increased. However, on it’s own, direct mail provides the best “Return on Investment” over any other advertising option. This is simply why many of the largest companies in the U.S. consistently use direct mail and according to BIA/KELSEY, more money is spent on direct mail annually than any other advertising medium. 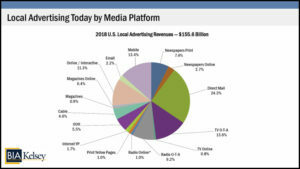 Should a business not have the budget to use mass media platforms correctly, then a great alternative would be a high quality shared direct mail program combined with online and mobile technology. This would allow a business to reach a targeted and qualified audience for a few cents per household. 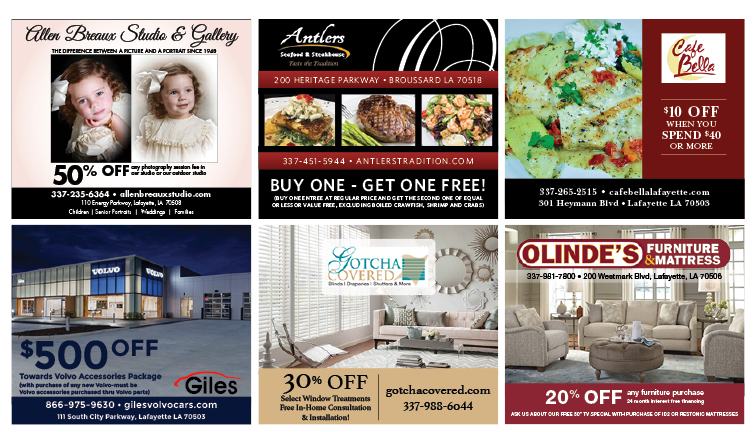 Let Direct Mail + Mobile Technology power your business! 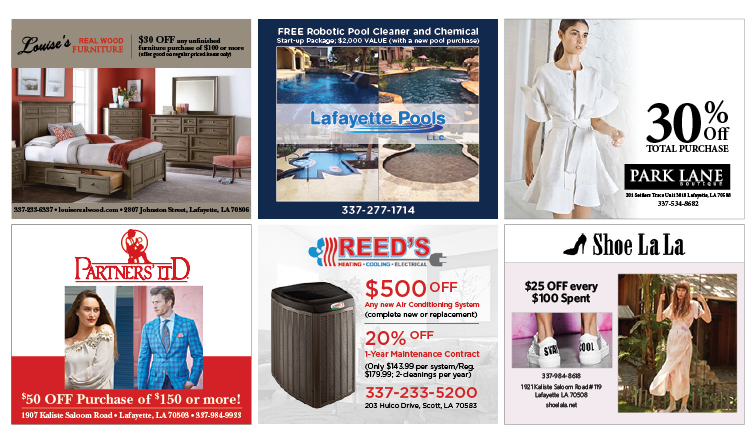 Let us show you how you could directly connect with 25,000 qualified households in Acadiana using our unique high quality direct mail booklet and receive a complete business call-to-action Mobile & Online profile for FREE!